Moving forward, we passed through the long, dusty, and bumpy road to reach the well known Magpupungko, located at the exact opposite of the island if you are standing in Gen. Luna. . There was an entrance fee of Php 50.00 collected by the municipal tourism office at the gate. According to them the amount collected is used for the maintenance of the public family recreational beach area. There were few tables standing on the site and a multi-purpose hall where a clan reunion was being held during our visit. There was a single improvised grill station in the area where we can cooked our food . Sad to know we have to wait for an hour before our turn since a lot of visitors flocked in during the weekends. When my companions brought out the sea foods , I was surprised that we're going to have a grilled stingray or “pagi” for lunch. 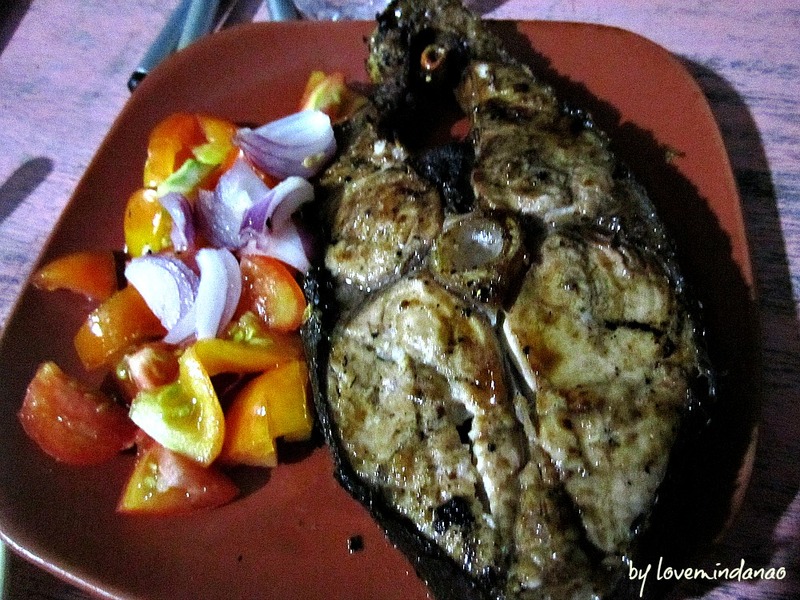 It was my first time to taste a grilled stingray and surprisingly it was sumptuous, tender, tasty and exotic. After our delightful and exotic lunch, we look for this famous landmark known as Magpupungko. According to the locals, Magpupungko means “sitting on top”or on a "squat" or “nakapatung” in Filipino language. It is a huge rock or boulder sitting on a very small foundation but has not fallen from where it was standing. It seems that the rock has found a very unique balance to keep itself attached to the ground and had become immovable from its location even with the presence of smashing giant waves during high tide and strong winds. Aside from the giant rock, the area gives you a fresh breathe of unique clear turquoise natural pool formations along the vicinity of Magpupungko. There were at least 4 natural pools that appeared during low tide and they were all beautiful and enticing to swim at and dive using the adjacent natural rocky cliffs. 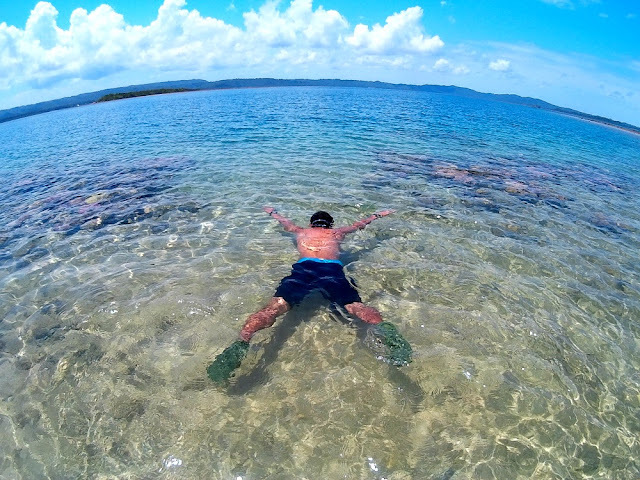 Since it was my first time and not sure if ever I will be able to come back, I took the opportunity to test my diving skills into the cool crystal water . I jumped from a 10-foot rocky cliff into the clear glass like water. I felt like I was actually swimming inside a giant aquarium.The pool is approximately 20-25 feet deep and coral formations are found growing and attached on the rocks, providing temporary habitat for various colorful marine animals trapped inside the pool. I tried to swim deeper but my body can’t take the high pressure without the proper gear. It was almost a non-ending fun, diving here, jumping there that left us all restless, draining all our energy to zero. Having satisfied with this little jaunt, we left the beach before nightfall and returned to GL Boulevard for our diner. In the nearby market, we decided to buy slices of fresh Mahi-Mahi, a first class gigantic fish for only Php 130.00 per kilo. We grilled the fish turned into a steak in one of the videoke houses in the boulevard for a very minimal fee (Php 20.00). After it was cooked , we enjoyed the three slices of fish steak with "bandehadong kanin" or platter of rice. The fish was really fresh. It was the best fish steak I have ever tasted in my entire life. I envy the people of Siargao as they are able to have a bountiful of marine resources just being caught in the nearby sea. After a couple of beer and singing and belting our favorite song master pieces, we returned to our hostel through motorcycles at Php 20.00 per passenger and give the peaceful night a rest from our beautiful voices. I've never swam in a natural pool before. What I wouldn't give to go to a beautiful place such as that... That rock formation is awesome! Wow, look at that! Awesome pics, mouthwatering food. The place is a beauty! Yay! I am drooling with the stingray, hahaha! And for this we will go out to buy some fish to grill hehehe. I would want to taste a stingray too. 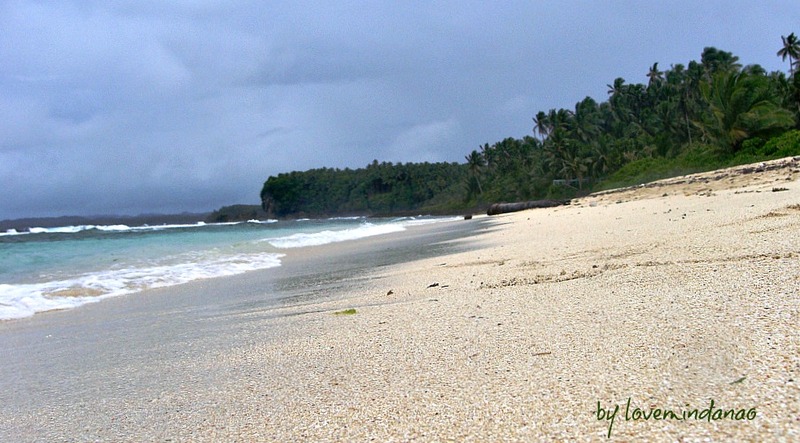 The magpupungko along the beach is really a nice scenery. it's a beautiful place, i want to visit there someday! Grabe! the place is so beautiful, stingray ba yun naka, haven't tasted it yet! The place is so breathtakingly beautiful as you presented it in this post. I'm sure you'll be able to convince a lot of people to visit because I would if only I could. I don't get the idea why many Filipinos love to travel abroad first when there are so many places in our country waiting to be explored. 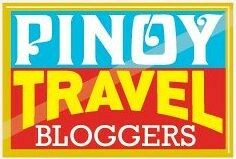 What a beautiful paradise!Truly, it's more fun in the Philippines! Yahweh bless! Unfortunately, there's only few places I have visited in the country and this wonderful is so inviting and i wish to go here with my family. I've heard beautiful things about this place! You photos captured its awesomeness!!! I'd love to just visit and enjoy God's creations! I would love to visit Siargao Island soon, I'v read about it on the Internet and has intrigued me for quite some time already.